Metro Manila with all its dirt and grime is still home. 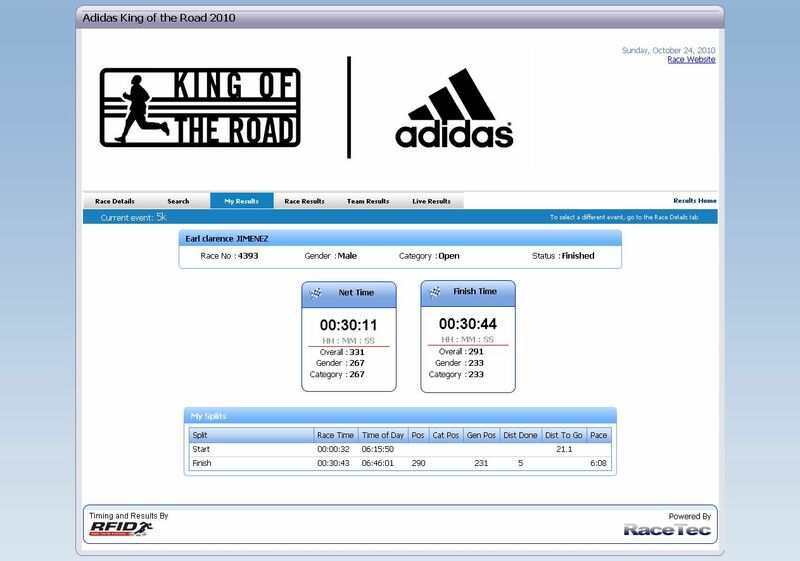 If it weren’t for the entire office signing-up for the Adidas King of the Road last Oct 24, I would have stayed put hat Sunday morning as I had an entire day’s workshop to oversee. But I was not to let myself out of the fun of joining the rest of the office people who on impulse, decided to fill-in the free slots given to Gold’s Gym as race sponsor. Never mind if most had never run a race before. Maybe it was the idea of getting a slot free when all others had to pay Php 850. My first run was more than a decade back at the anniversary of another gym. My friend April and I decided to join the 3k for the heck of doing something different. There was no training or whatsoever. In fact, we were chatting merrily away when the call to start came and we simply stood-up and ran. The route started and ended at Pasay Road and wound around Dasma. It was my first-time to enter the gated village and I think spent quite some time trying to look at the beautiful houses while running. I don’t remember how long we took to finish it but I remember my aching legs during the aerobics marathon in the evening and the Salonpas I covered it with. Fast forward to 2005. I joined the Bull Run organized by the Phil Stock Exchange and did 5k in 45 minutes. I would have gone on to more runs but a bad right knee and aching shins ended it. I never really run as cardio workouts are always brisk walking or a light jog done on an inclined treadmill. I’d really would rather hike or climb mountains. Working out at cardio machines always bore me and 30 minutes can seem like 30 hours. For the Adidas run, I only ran about 3 times just to check my speed. I was aiming at most 40 minutes and in my last practice run, I clocked in at 35 minutes. Woke-up at around 4:30 for a quick breakfast of oatmeal with peanut butter just to keep me going for the run. Carina, Ella, and MM picked me up around 5 am and we were at The Fort before 5:30. Gun start was still at 6:15 so there was enough time. We put on our race numbers, strapped the RFID timer on our shoe laces, and stretched a bit. There about hundreds of runners milling about near the starting point where we caught up with Mona. The energy in the air was palpable as people stretched, chatted, and generally tried to look like the serious athlete that most probably weren’t. I slathered some ointment on my left shin to keep it from aching, a tip I picked-up from Ruel. A thousand 5k runners finally took off to the beat of live drums. It took some time before I was able to find space to actually run. The first hundred meters was like running through a maze of people just to keep your pace. I wasn’t familiar with the route as just took a cursory glance at the map. Bad move. I should have memorized it just to motivate me and plan my pace. All I know was there was a water station somewhere. When I finally reached it I knew I was at least nearing the half-way mark. The trail was crowded with so many runners and it was compounded by the 10k runners going on the opposite direction. It was only when we reached the turn-around where we had the entire road to ourselves. I admit there were times when I was tempted to slow down to a jog or even walk especially when I was surrounded by people who were doing just that. Reaching the turn-around motivated me to move a little faster. I finished the run in 30 minutes plus seconds. Not bad. we grabbed our free packed breakfast of 2 pieces pandesal and a hotdog. Back at Timog, we all had a hearty buffet breakfast at Marina courtesy of Carina who was having her birthday next week. I enjoyed the run and I think it’s something I want to do again. It was definitely more enjoyable than running on a treadmill. There are sights to see and you actually have a destination. I’ve actually signed-up for the Vertical Marathon on the 27th, my birthday. I feel it’s something more up my alley as it will be just like going up mountains plus I do climb up and down stairs a lot. Maybe next time I should try a trail run. Last Saturday, I found myself at the Quezon Memorial Circle for a baptism reception at Max’s Restaurant. It has been ages since I’ve been to the Circle and even way back in college I’ve only been there about 2-3 times. What I remember about it was the all the greenery. The grass was neatly trimmed and kept and there were bike and foot paths. It was park. But what I saw last Saturday was ghastly. It looked like one big massive constructions site with not a spot of grass around. Perhaps it was the El Nino? But how come UP managed to keep all its grass? The few trees that were there seemed forlorn and brittle. Where once there were spots where you could lay a blanket and sleep under a tree or have a picnic, there was just dirt. Row after row of eateries also lined the circular pathway. It no longer seemed like a park. All that was missing were rides and it could very well have been an amusement park. Add more shops and it would have been a strip mall. Maybe that’s what the park handlers really had in mind, to turn it into another concrete mess called a mall. You would have thought that since the park houses the memorial where the late President Quezon is interred, it would be all green and dignified just like a memorial should be. Or maybe they wanted it to look like a memorial garden on All Saint’s Day when hordes of hawker stalls descend. Sad. Sad. Sad. I know it’s a long shot to be likened to New York’s Central Park but the Circle could have been what Lumphini Park is to Bangkok— a breath of fresh air in a polluted city. On my first trip to Bangkok, staying at a hotel near the park, I would hie off to the park and run along its footpath every morning before breakfast. I even got to use one of the open air gyms tucked in a corner. I thought it was for free until a woman approached me and asked if I were a member. I apologized and volunteered to leave saying I was a tourist but with a smile, she stopped me and said to finish my workout. For free were some pneumatic machines scattered on a circuit around the park. In the morning, groups of people would converge for aerobics, yoga, tai-chi, and other forms of exercises. Another pretty park I stumbled on while on self-tour on foot of the Banglamphu was Romin Park (I’m not sure if that was the name) that had English landscaped gardens and a little wat on a side. Back to the Circle, it was really disappointing to see what has become of it. I guess we really can’t expect much. We turn our forests into deserts, our mountains into dusty hills, so what more with a park surrounded by government buildings and just across the city hall? Perhaps the wasteland that the Circle is now represents our country’s approach to urban planning. Nothing but dirt.